Cute little barrel rattle with a smiley face on it. Measures approx 6cm long x 5cm wide. 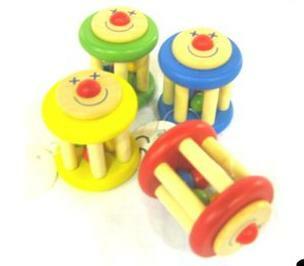 Rattle contains 4 different coloured wooden beads (Red, Yellow, Green, Blue). As with all rattles for small babies if it gets broken the beads will be a choking hazard, please supervise children at all times. Lucky dip for the colours, please specify if there's a colour you don't want. Click the button below to add the Wooden Barrel Rattle to your wish list.